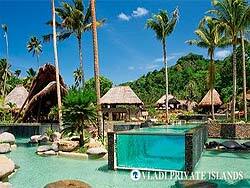 HOME » Island Resorts » Fiji: Laucala Island Set To Close! The Private Island News Team received something of a shock this morning as news filtered through to us that one of our favourite Fijian retreats is set to close after five fabulous years at the top end of the island rental industry. Fortunately, however, all is not as it seems, and the luxurious island will be back in business after three action-packed months of renovation-work. Phew! In only five years of operations, Laucala Island has established itself at one of the world’s ultimate island retreats – a haven of lush tropical jungle, beautiful beaches and a level of luxury otherwise unknown to man. Those island aficionados lucky enough to have visited the island will no doubt be asking themselves how it is possible to improve on perfection, but island owner Dietrich Mateschitz already has a few ideas up his sleeve. The closure, which extends from January 16th to March 31st 2014, will see a number of changes to the iconic island retreat, including a facelift of the extensive road network, which will see all the roads repaved in a classic cobblestone fashion. Each of the island’s villas, restaurants and spas will also undergo enhancements during the closure, with all refinements directed and supervised by the island’s interior designer, Lynne Hunt of London, England. The renovation work forms part of a long-term plan to achieve the Red Bull impresario’s goal of transforming Laucala into one of the top three island resorts worldwide and comes as the next step after hiring a high-profile global advisor, receiving the prestigious accolade of becoming one of the Leading Hotels of the World and a high-tech addition to the island’s inventory: a Deep Flight Super Falcon Submersible Craft. Here at Private Island News HQ, the countdown is already on for the resort’s re-opening on April 1st 2014, and you can rest assured that we’ll be amongst the first to share all the important info about the incredible improvements. Alternatively, if you want to check out the changes for yourself, head over to Vladi Islands Travel for all the expert advice you need to enjoy the holiday of a lifetime. Don’t forget to send us a postcard though!